He's just cramming for the finals. "Yes, I can actually read this fast." Everybody knows smart people love reading. That's why surrounding a character with big, thick, difficult-looking books whenever possible is considered an acceptable way of indicating that that person is meant to be brainy. Every now and then, though, you'll find yourself in a situation where you want to establish a character as even smarter than your run-of-the-mill smart guy. You may even want to convey that they're some kind of bona fide genius. So what do you do? Easy. You show them reading really, really fast. 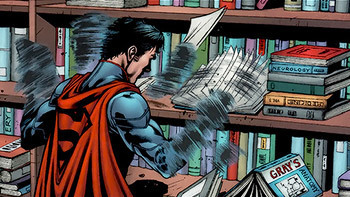 Super-Speed Readers are characters who are seen turning the pages of books at improbable speeds, presumably retaining all of the information they're flipping through, as a way of demonstrating their intelligence. While it is possible for the audience to learn a character has this ability in some other way, in visual media, it's fairly common for a scene to be present where we actually get to see this feat performed, most likely because occasions where high IQ can actually be translated into to exciting visuals are few and far between. Disappointingly, speed reading in Real Life is not actually a function of raw IQ, but a learned skill which involves tedious practice and sacrificing some degree of comprehension in favor of speed. Also, in order to make this sort of thing look impressive on film, it's generally necessary to depict characters reading at a rate that would noticeably exceed those of the fastest known real-life speed readers, if anyone in the audience were to get out a stopwatch and do the math. Neither of these things are of any concern when a speed reading character is meant to be supernaturally intelligent, though, which is often the case when this trope is in play. One of the things the other 90% of Your Brain is used for. Often seen alongside, or even conflated with, Photographic Memory. Potentially a skill of the TV Genius, particularly when he has an IQ score that is too high to make sense. The Emergent Human will use this skill to get caught up on the sum total of human knowledge over a long weekend. Don't expect anyone to ever get carpal tunnel syndrome from turning thousands of pages per minute — the less-glamourous Required Secondary Power of "Super Page Turning" is bundled in for free. Lucy from Fairy Tail has a special artifact for this. Yuki Nagato from Haruhi Suzumiya, with good reason. In Kujibiki Unbalance (the original version), evil genius Renko reads through a whole bunch of cookbooks in seconds in order to direct her team in a cooking competition - but she can only remember what she reads for three minutes. Yuuno of Lyrical Nanoha has a spell that allows him do this on several books at once, making him the ideal scholar and head librarian of the Infinity Library. After StrikerS, he teaches this spell to Vivio. Ryuu Tsuji from Special A pulls this one off to read all 1000 questions in the test battle with his SA privilege on the line and then answering all of them in 10 minutes. He got all of them right. The various Flashes can do this using their super speed. They don't tend to retain the information long, but it's usually enough for their purposes. Exhibit A: Wally West blitzing through 215 books on engineering, then single-handedly repairing an entire bridge in the thirty seconds it stays in his head. Bart Allen (Impulse/Kid Flash) was established as different from other speedsters when it was revealed he can speed read AND retain everything he read (other speedsters can speedread but forget about the facts they researched soon). Subverted in that Kid Flash is still a hyperkinetic attention-deficit teenager and not exactly a genius. As does The Leader from Marvel Comics. Quicksilver of Marvel Comics can do this as well. In a Spirou and Fantasio comic, the Count of Champignac temporarily gains this ability after injecting himself with a Super Serum that increases intelligence. The Tangent Comics version of Superman first expresses his "otherness" this way. 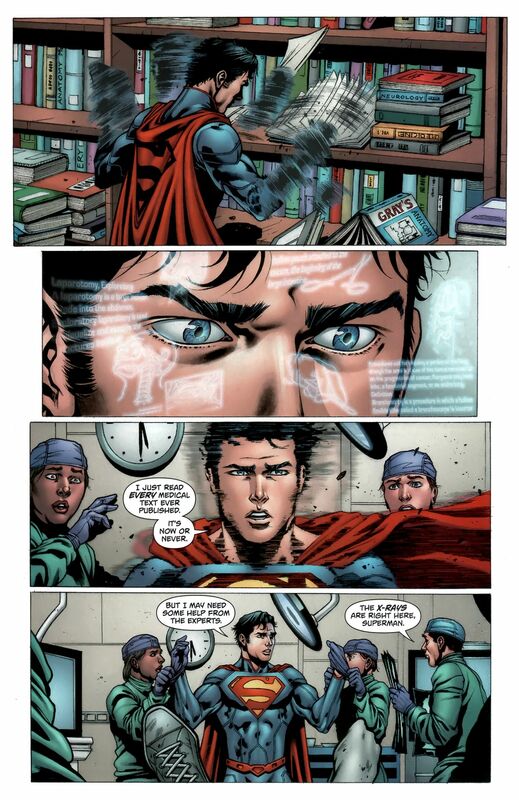 The mainstream Clark Kent version of Superman can perform the same feat ◊, unlike the latter above he can genuinely do so as he actually possess super-speed as a power. In Calvin and Hobbes, Calvin once flips through a book rapidly to hurry through a reading assignment. As Hobbes comments, "reading is easy if you don't sweat comprehension." In Hard Being Pure, Noa goes on a research binge in Phobias library, using disjointed eyeballs and some telekinesis to process 20+ books at a time. Hermione in Harry Potter and the Methods of Rationality borrows a few rather advanced science books from Harry on their first day of school and has read them within a few days. In DuckTales the Movie: Treasure of the Lost Lamp, the young genie character reads all of the encyclopedia set in the ten seconds he is off-screen, though this may be more to do with him being magic and a Keet than being super-intelligent. In the film version of Flowers for Algernon, Charlie can do this after it's clear that something's very wrong with him. George Malley, protagonist of the film Phenomenon as played by John Travolta. And that's not all he can do. Johnny Five does this in the Short Circuit films. Johnny Five: *reads, then pauses* I think The Butler Did It... *reads for two more seconds* He did! Transformers: Revenge of the Fallen has Sam gain this skill and go mad in the process. In Twins, Arnold Schwarzenegger's character being a Genius Bruiser, he reads through the car manual pages in seconds. He does use the real-life technique of tracing sentences with an aid (his finger) in order to stay focused. In Wonder Man, one of the brothers played by Danny Kaye speed-reads two books at once. Belgarath of The Belgariad mentions offhand that he can read and comprehend a whole sentence in a glance. His daughter, Polgara, can read a whole paragraph in the same time. Discworld: Brutha of Small Gods, by virtue of his ability to never forget anything he saw, no matter how fleeting. This ability of his was shown when, in probably around an hour's time, he memorized half of the books and scrolls stored in the Library of Ephebe, the second largest library in Discworld, moments before the Omnians burned it down. Granted, he can't actually understand it, at least at first, because in addition to a photographic memory he is completely illiterate and appears to have some form of dyslexia. In Flowers for Algernon, Charlie at a point mentions he can read a page per second. Magic: The Gathering: Planeswalker Teferi tops them all. Teferi: [eyes glow blue] About that long. Radha: You just read the entire Book of Keld? Teferi: Read it, memorized it, ready to recite it. Inverted in R. A. Lafferty's short story "Primary Education of the Camiroi", which features an alien race who regard those who read rapidly as intellectually inferior on the grounds that they don't take the time to absorb and memorise every detail. In Robert A. Heinlein's Stranger in a Strange Land, Valentine Michael Smith can read at incredible speeds. He is very intelligent, though he starts off naïve and inexperienced. Although he hasn't exhibited this ability for real (yet), Sheldon does it jokingly when he gets the new issue of The Flash. Sheldon: Hello, Fastest Man Alive. Wanna see me read your comic book? [frrrp] Wanna see me do it again? It is implied at times. For instance, when he had to read Amy's favorite novel, Pride and Prejudice, so that he could mock it, he appears to have finished it by the time he comes home from work the next day. One time he was bored on a day off and decided to learn Finnish, and by the time Penny drops in he seems to be halfway through the instruction book. It has to slow him down that he stops and pronounces new words. When Penny offers to teach him acting, he has read four books on acting between the invitation and the class, including a beginner's "for dummies" style book and Stanislavski's An Actor Prepares. When reading a paper a colleague won a money prize for he spends five seconds looking at each page, demonstrating understanding as he goes. Phoebe speed-reads the dictionary after using a spell to make herself smarter. Leo sometimes uses his whitelighter powers to speed-read things. Spencer Reid from Criminal Minds is seen doing this on camera despite being an ordinary, non-superpowered TV Genius. Becomes useful in one episode, where a suspect has filled hundreds of notebooks with potentially incriminating information. It would have taken normal readers a week to get through. Susan: I'll have finished it. Done by the Fourth Doctor in "City of Death". He liked it, though it was a bit boring in the middle. In "Rose", the first episode of the revival, the Ninth Doctor displays this skill as a throw-away gag, flipping through The Lovely Bones and then tossing it away, bemoaning its sad ending. Done later in "The Time of Angels" with Eleven. He flips through a book in two seconds flat, declaring that it wasn't bad but slow in the middle. Also, he hated the author's girlfriend. Barry Allen can use his Super Speed to do this (as shown in the episode "Fast Lane"), though it comes with a side of Reality Ensues: Since he didn't take the time to memorize the information, he can only hold onto it for a short time before he has to do it again. At the beginning of season four, Barry returns from the Speed Force and needs to catch up on about six months of pop culture. Cisco hooks him up with a 1000-times-speed TV. Kyle from Kyle XY, a super-intelligent but inexperienced genetic experiment, reads an entire encyclopedia in an afternoon in order to take a level in normal. Seever on Life can speed read; she also possesses a Photographic Memory. Monk demonstrated this ability in an early eighth season episode while reading a magazine with Natalie, with him rapidly flipping through it and then getting yelled at by Natalie for giving her no time to read the articles. Monk, of course, makes fun of her "slow" reading speed. Of course, speed-reading is justified in his case due to his Hyper-Awareness. Also invoked in the book Mr. Monk and the Two Assistants, where there is a scene where Monk speed-reads through several of Ian Ludlow's mystery books, and quickly complains that the books are just using the same formula, again due to the same Hyper-Awareness. He also gets a job as a fact-checker at a magazine, having quickly flipped through some of their older issues while waiting for his job interview, and then points out obscure errors by reciting the lines from memory. Luke Smith, also a naive superintelligent science experiment, reads a textbook in minutes in the pilot of The Sarah Jane Adventures. Sylvester Dodd of Scorpion possesses this ability. One episode revolved around his reading 100 pages worth of classified information in the scant few minutes he had. Later that same episode, he reads about 30 pages worth of information in the time it took for it to rapidly flash across the screen. On Stargate SG-1, in an episode where several team members are granted super powers by an alien artifact, Daniel Jackson is depicted as reading through large volumes in mere seconds. Inverted, slightly — in the same episode Carter is shown writing a book on wormhole physics so fast she has to keep pausing because the computer's input buffer can't keep up with her. Data on Star Trek: The Next Generation is often seen doing this. Justified by his being an android - he only requires a single glance to memorize a page. In the pilot episode of the original Star Trek, Gary Mitchell is struck by a space-phemonenon that turns him into a god-like superhuman; he first displays this by reading at an amazing speed. Adam McArthur is shown doing it in The Visitor. Several game systems allow players to pick a speed-reading trait during the process of character creation; naturally, speeds reached are a function of the intelligence stat. GURPS makes it a skill so anyone can be really good at Speed-Reading, although a high IQ stat helps. Truly super speed reading is the domain of the Scholars in the Dungeon Fantasy books who can compress 200 hours of study into an hour, even to learn magic or skills that bend the laws of physics. In Eclipse Phase mental speed nanoware enables a character to read at ten times normal speed. In games by Palladium Books, Speed Reading is a psychic ability. Remembering it all is a different ability. Persona 5 has a downplayed example of this: the fourth and final book you can buy at Jinbochou Book Town is a guide to speed reading. Reading this book allows you to read books that would normally take multiple sittings in only one sitting, saving you time. Of course, by the time you get the option to buy this guide, you've already had to read 3 books that take 3 sittings each. It could still be useful if there are still books to read from the other bookstores or the library that take 2 sittings to finish, however. Abel of Dan and Mab's Furry Adventures uses a spell to flip through a book in seconds, then tells Jyrras to look up a specific page. But then the store manager tells him "you scry, you buy". Grace, the human/alien/another alien/squirrel hybrid from El Goonish Shive is also seen reading textbooks at superhuman speed. She got enhanced short-term memory , probably from free-shapeshifting ancestors. Peanut of Housepets! is capable of doing this, even though he's not suggested to be a genius. Even Fox, who is a bookworm himself, is impressed. Brian of Rhapsodies whenever he has to "learn" something. In Part 4 of Lovelace ½, Mr. Stone tests Andi's mysterious new ability by handing her a book of Shakespeare's sonnets and instructing her to skim the book as fast as she can. She does — and remembers the entire sonnet sequence perfectly afterwards. It's a part of the stock mental package of the Exemplar mutant power set in the Whateley Universe, along with lightning computational skills and sometimes a danger sense or directional sense. The higher your Exemplar (mental) level, the faster you can read, the easier you can memorize anything you see, and the faster you can do basic algebra types of math. It doesn't make you smarter, but it does make you better able to get good grades. Also, plenty of Exemplars do not have the mental package that goes with their level of power (and some who do, don't apply it - Solange, for example, was happy to coast, assuming schoolwork is for those with wealth and good looks, until she finds herself forced to actually think her way out of her bad decisions). In an episode of The Adventures of Puss in Boots, needing to go through an entire inventory of a massive treasury to find the one thing that is still missing quickly, Puss employs the Dangerous Forbidden Technique of Speed Reading to do so. This appears to be an actual special technique as the pages magically turn by themselves and begin overheating as he does it. One episode of American Dad! has Francine, in response to Stan restarting his efforts to dig for Oliver North's gold under their house, claiming that the gold's a myth like unicorns, or speed reading. Bender, as well as every other robot, does super speed reading routinely. Played for Laughs when after doing it, Bender declares the book "alright..."
Taken Up to Eleven in an episode of the sixth season where Bender gains Super Intelligence after being overclocked and proceeds to read the Professor's whole library in seconds. In fact, he starts overheating from his sheer reading speed and he has to jerry-rig a new cooling system for himself out of a water cooler. Lisa and her soon-to-be boyfriend bond over speed-reading the one textbook they both wanted in the episode "Lisa's Wedding". They appear to finish it in an afternoon. In "They Saved Lisa's Brain", the whole Mensa group including Lisa finished reading the town charter (which is a scroll-sized page) in seconds. Theodore Roosevelt could read an entire page in the time it took anyone else to read a single sentence. Kim Peek note the inspiration for Rain Man was able to read a book an hour scanning the left page with his left eye and the right page with his right eye. Advanced Query Tool comments on some users simply clicking through the end-user license agreement, noting that you only took 2.2 seconds to read 350 words, and that you probably have a speed-reading world record.